MICHELLE WOODS is half-Irish, half-Czech. She is an English Professor at SUNY New Paltz, an inveterate reader, and the author of Translating Milan Kundera. In the last few years, I’ve been hoping that the Greek god Hermes would come along and help Benjamin Black stash John Banville away in the underworld for a while, or at least turn Black/Banville into a fantastical hybrid creature whose gorgeous appetite for language would come to a mix in some intestines of plot. Banville has been writing quite fine crime fiction under the name Black, while also writing his literary fiction. He speaks of the two identities in a Jekyll and Hyde way; when writing in one identity, he says, the other leans over the shoulder and tries to seize the pen. Banville won the Booker Prize for his last literary novel, The Sea, an overwritten, unplotted novel I couldn’t finish. To this day, each time I pass it on the bookshelf, I still snarl at it. I picked up his new novel, The Infinities, just out here in paperback, at the train station and beat up on myself all the way home. Guilt, I said to myself, that’s what made me do it; guilt for not finishing the other bloody novel I hated. Curling open the front page, I bent into the novel, that little snarl twitching at the corner of my lips. The Infinities takes place in one day at a big house in Ireland, where the patriarch of the family, Adam Godley, is dying up in the attic, in the Sky Room. In a slightly alternate universe (where, in the past, Mary Queen of Scots beat and executed Elizabeth and in which “bellicose Sweden” is at war with all her neighbours, little white soldiers running about on the tundra), Godley is famous for his theory of infinite worlds. These are explained by an unexpected guest, Benny Grace. 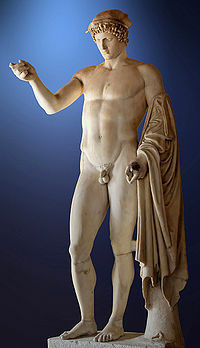 Surrounded by a damaged family, and lusting after his daughter-in-law, Helen, Godley (although he’s in a coma) brings us on a tour of his family and his past-via the cheeky, intrusive and delightful Hermes, the Greek god. Say you are walking down a not particularly crowded street. You spy, at quite a long way off still, out of the corner of your eye, out of the corner of your watchfulness, as it were, a stranger who, you can see, has in his turn become aware of you as you approach him. Even at that distance you both begin to make little adjustments, covert little feints and swerves, so as to avoid eventual collision, all the while pretending to be perfectly oblivious to each other … I am always, always on guard against coming smack up against one of my own kind. Luckily, the Gods, the Infinities, ones not of his kind, have taken an interest (if only in his own mind). Hermes threads the consciousnesses of the people of the house into a chain of a kind of overlapping, and always (how Irish!) unstated, love. Hermes is busy spying on the family. He’s trying to gain access to Helen for his lustful father Zeus. He succeeds. The novel ends in a dusk of unexpected harmony, even for Petra, the damaged daughter whose hands are “the scrabbly pink claws of a rodent” and who sleepwalks “her eyes rolled up into her head and her mouse-claws lifted in front of her chest.” In the daytime she moves “eyes lowered, arms tightly folded as if to prevent herself from flying apart in fragments, nodding and nodding like a child’s mechanical toy”. She can’t bear the sight of her dying father and spends her time writing an encyclopedia of human morbidity, the Florilegium Moribundus Humanae. Hermes pops up in the body of the inarticulate handyman Duffy, in the back seat of cars, in Rex the dog to spy on them, gossip about them, and prepare the ground for his father, Zeus, to seduce Helen. Hermes’ humorous self-awareness about his grandiose language (“so rarified is our heavenly speech”) and his complaints about his father (his “mosquito whine”) let Banville play baroquely with language and with the intimations of mortality (invoking Joyce’s “The Dead”) while poking fun at the very urge. Banville is out to play in this novel, and if you’re willing to hide in the bushes alongside Hermes and enjoy the whimsicality, it’s a delightful read. 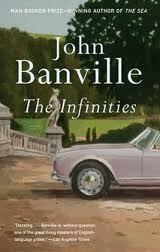 “To my great surprise,” Banville said in an interview, “it’s a happy ending.” For me too. I’m almost tempted to traipse pass that bookshelf and let my fingers light across The Sea’s spine.